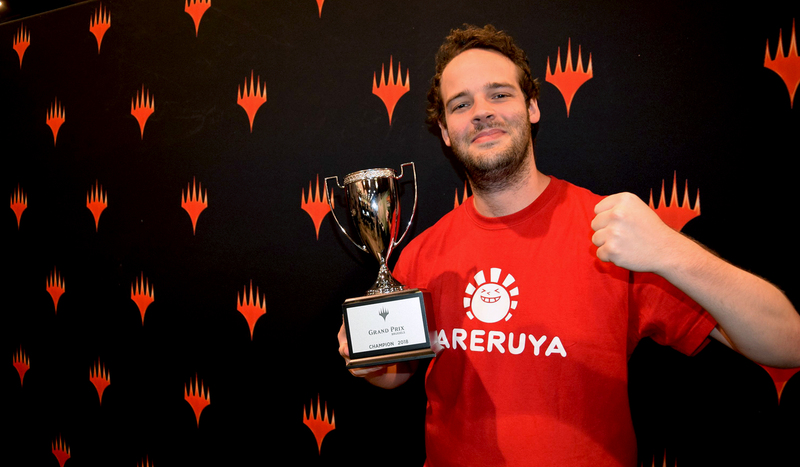 Playing Esper Control in Standard, Jérémy Dezani defeated all comers, including Guillaume Wafo-Tapa in a quarterfinal mirror match and Giordano Fagiolo in the finals, to become champion of GP Brussels 2018! THE HASHTAG FOR GRAND PRIX BRUSSELS IS #GPBRUSSELS. JOIN THE CONVERSATION. We saw Goblins whirling chains and Teferi being heroic; we saw Bolas ravaging and steeled champions stomping; we saw statuaries inspiring rather orthodoxical outcomes and fates being sealed with the help of the odd nexus or ten. Now it was time for the remaining 240 players, everyone who survived the first day with a record of 6-2 or better, to battle it out for a shot at the Top 8 and later on, the title and trophy. Tune in and watch all the action live from the battlefield of Grand Prix Brussels 2018! When the dust settled after the first day's eight rounds of Standard play here at Grand Prix Brussels, what had begun with 1,109 players in the morning was reduced to a mere 240. The number of undefeated players was down to just eight: Craig Barnes, Pascal Vieren, Socrates Rozakeas, Oliver Suters, Thijs van Maaren, Thomas Mechin, Marios Angelopoulos, and Alexander Gordon-Brown. These eight would have a head start over the competition on Sunday, but said competition included fearsome opponents such as Thomas Hendriks, Marc Tobiasch, Pierre Dagen, Ivan Floch, Arne Huschenbeth, Loïc Le Briand, (6) Martin Jůza, Autumn Burchett, Geoffrey Siron, Jaroslav Boucek, and Gary Campbell all at 7-1. With a cast like that and turbolent times in Standard, the stage was set for a second day which was not to be missed. So tune back in tomorrow and watch all the action live from the battlefield of Grand Prix Brussels 2018!